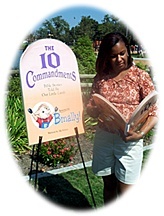 You would like to schedule Ms.Vivica and Bmally for personal reading of the Good Book series, including a book signing. You would like to know more about PRAZE KIDS, The Children's Discipleship Program. You would like additional information on any of PRAZEUP'S products.